Home > Membership > Nonprofit World > Is Hiring a Coach a Good Investment? 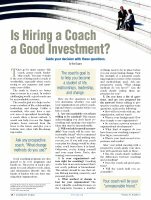 Is Hiring a Coach a Good Investment? Guide your decision with these questions.